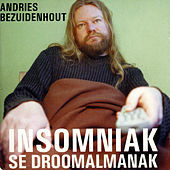 Insomniak se droomalmanak is Andries se eerste solo-album en is in 2003 deur Rhythm Records vrygestel. Soos die titel sê, handel dit oor slapeloosheid en drome. Andries Bezuidenhout subscribes to the introspective, thought-provoking school of minimalist philosophical expression, commenting on life and the world, from the little things to the bigger picture… The poetic themes of the dream world, the waking dream, sleepwalking existence and the reflection of South African city and suburban life, changes, angst and being white these days may be a heady mix, but it works. [A] proper follow-up to Koos Kombuis’ seminal ‘Niemandsland’… On ‘Insomniak se Droomalmanak’ singer/songwriter Andries Bezuidenhout has taken Koos’ knack for melody and bittersweet Afrikaans lyrics and catapulted them into the new millennium.